Product prices and availability are accurate as of 2019-04-23 09:46:57 UTC and are subject to change. Any price and availability information displayed on http://www.amazon.com/ at the time of purchase will apply to the purchase of this product. TigerNuts are not actually nuts but small root vegetables! We have been deeply connected to these nutrient-dense tubers for millions of years. A January 2014 study by Oxford University revealed that 2 million years ago our earliest human ancestors relied heavily upon this root which fueled up to 80% of their diet! 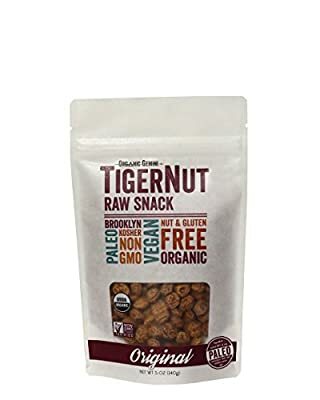 TigerNuts are the #1 whole food source of Resistant Starch, a PREbiotic fiber that resists human digestion and becomes fuel for our PRObiotic bacteria. A healthy gut makes for a happy human, so follow the intuition of our Paleo ancestors and eat some TigerNuts! Ways to Enjoy: - Raw, straight out of the bag - Soaked in water to soften and enhance flavor. Both = Awesome! You can even blend them into a traditional Spanish beverage called Horchata! We at Organic Gemini make our very own TigerNut Horchata, a cold-pressed beverage with all the health benefits of TigerNuts. Look for one of our seven different flavors in your grocer's cold drinks section! USDA Certified Organic - NON-GMO Project Verified Paleo - TigerNuts fueled 80% of our pre-human ancestors' diet about two million years ago! Nut-Free, Gluten-Free, Allergy-Free, Raw, Vegan, & Kosher... and made in Brooklyn! Resistant Starch - A prebiotic fiber that supports a healthy immune system. One serving is 40% of your daily fiber requirements! Not actually nuts, TigerNuts are actually small root vegetables!